This past winter, Metro asked for the community’s feedback on routing and stop locations for the RapidRide E and F lines, which will start rolling in 2013. This feedback has helped shape the preferred route designs that Metro and the King County Executive submitted to the Metropolitan King County Council today. Metro chose this routing after hearing the community’s safety concerns about people crossing Aurora Avenue N at N 68th Street to use a northbound stop. It also addresses people’s feedback about the appropriate place to locate a pair of stops in this area. Metro is now in discussions with the City of Seattle about placing a southbound RapidRide stop on Aurora Avenue N near N 66th Street. If a safe stop design can’t be accommodated on Aurora Avenue N, the E Line will follow the routing of current Route 358 in both directions, with a single pair of stops on Woodland Place North near N 64th Street. The preferred route design adds two stops that were not included in the original proposal: at N 80th Street and Lynn Street (see map). Between the Burien Transit Center and the Sounder Tukwila Station, the F Line will mostly follow the route of current Route 140. 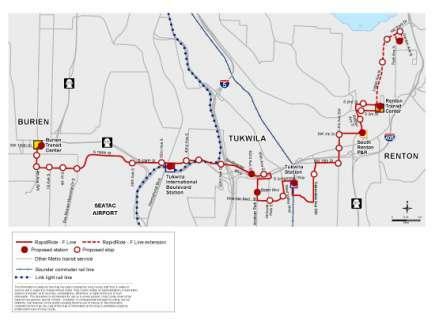 Between the Tukwila Sounder Station and the Renton Transit Center, the F Line will serve the Strander Boulevard extension (when it is completed), Oakesdale Avenue SW, SW 16th Street, Lind Avenue SW, SW Seventh Street, Rainier Avenue S, and South Second and Third streets. This preferred routing responds to concerns we heard about transit coverage on Lind Avenue SW between SW Seventh and SW 16th streets. We’ve also added three stops along Lind Avenue SW at SW Seventh Street, SW Grady Way, and SW 16th Street, near employment centers in Renton. Metro also asked the community to weigh in on a potential future extension of the F Line to The Landing in Renton. The preferred alignment for this extension would serve Logan Avenue up to N 10th. The return routing would serve Park Avenue N to Logan Avenue N. The extension would include a RapidRide station on N 10th Street at Park Avenue N and three regular stops. The extension to North Renton would add about 8-10 minutes of running time to the F Line. At present, the service hours are not budgeted. 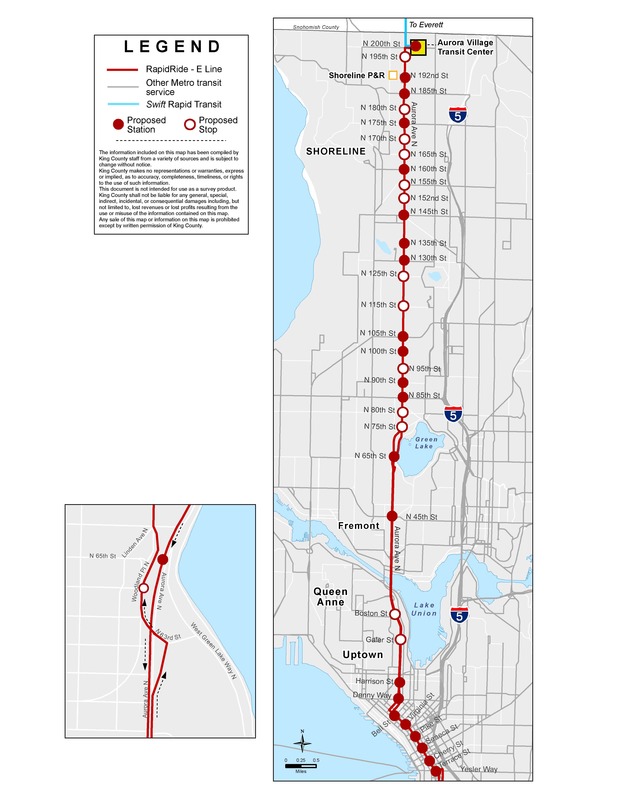 Until Metro identifies additional resources to pay for it, the F Line will operate between the Burien and Renton transit centers as originally planned. People will have an opportunity to comment on these preferred route designs at an upcoming meeting of the King County Council’s Transportation, Economy and Environment Committee in mid-July. Members of the public are welcome to attend and provide public testimony. Stay tuned for updates. Previous Previous post: Which pathway should buses use once the SR-99 tunnel is done? Seatac Airport so elderly can WALK a short distance to airline desks? 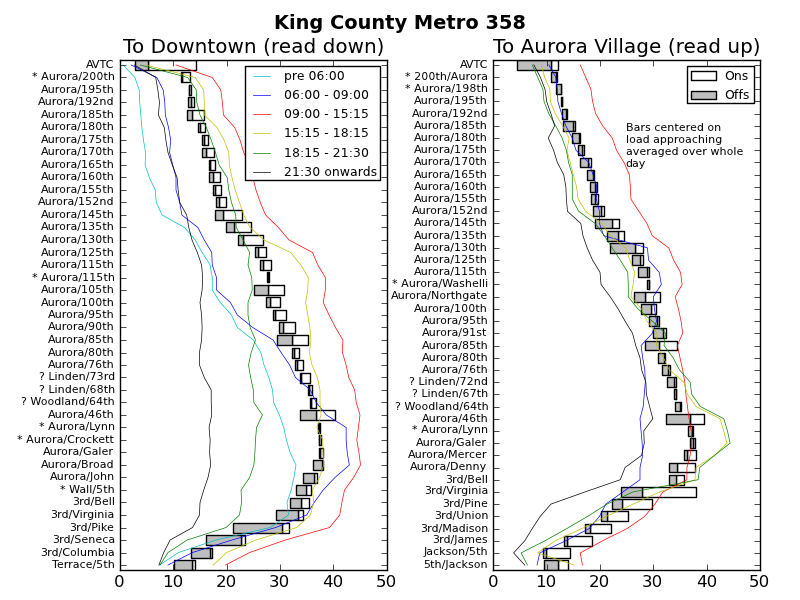 “Between the Aurora Village Transit Center and downtown Seattle, the preferred E Line alignment will mostly follow the routing of current Route 358. The one exception is between Winona Avenue N and N 63rd Street, where the southbound E Line will use Aurora Avenue N rather than Linden Avenue N” What this comment doesn’t highlight is that two southbound stops will be ELIMINATED. I don’t see any stops between 75th and 65th…the stop at 72nd & Linden is a very popular stop. Wow… line F will do nothing but clog up Renton with huge empty buses. I never needed to travel to Burien from Renton TC, and even if I have to for some weird reason, there is an express route 560 already. I was hoping for some direct service from Benson Hill to Bellevue or Seattle, and then i read that this new service will replace route 140. That route is never even crowded. I can’t even travel from Benson Hill to Renton Highlands without a transfer in Renton TC ughh, but now there will be even more buses to Burien? Ok, well, you will see a lot of empty buses line F then. And no I will never use it to transfer to a light rail in Tukwila. 161 will get me to Seattle way faster than this, even without any transfers in Downtown Renton. Congrats council members, on yet another waste of our tax dollars. Re: Rapid E: The move to use 63rd as a stop both ways seems to me to meet much of the legitimate concerns expressed at the community meeting I attended. However, no mention is made of the issue of parking. Use of the property formerly known as the “Greenlake Farmer’s Market” might be workable for that stop N & S, and for some parking. Leasing parking space from the church across the street would seem like a feasible option to create additional parking without unduly impacting the neighborhood. Re: The E line: I was at the community meeting where we were invited to place a sticky dot on a map, indicating our desire to preserve a stop that Metro planned to remove. There was a giant mound of dots on the 64th and Woodland Place stop. That Metro still insists on trying to replace that stop with one further east and north indicates exactly how little Metro cares about the opinions of its ridership. If the worry was about a northbound stop on Aurora and 68th, what is the rationale for removing the southbound stop from 64th? Those of us who live in the Phinney neighborhood are restricted to only 2 bus routes, both of which travel only north-south. I already have to walk a mile to work from the closest drop-off stop and 4 blocks to the bus from home. If you move the stop out to Aurora and 66/67, I’ll also have to walk a mile TO my stop. Anyone living between the zoo and that stop will have to walk more than a mile, as the next southbound stop is 46th. It already takes me 45 minutes to bus to work (which is a 10 minute drive). Moving the stop northeast would make my commute an hour, to South Lake Union. I think anyone who lives nearby would have the same problem. This is not express service, by any stretch of the imagination. RapidRide C Line will actually go all of the way down to Barton/Roxbury via California Ave and Fauntleroy. For more detailed info about High Point service, here’s a link to a map that shows the adopted bus route changes going into effect on Sept. 29.: http://www.kingcounty.gov/transportation/~/media/transportation/kcdot/MetroTransit/HaveASay/201209P4/Area10_WestSeattle_info.ashx. Thanks! Adding stops to the E line would be a serious mistake. For a limited-stop BRT route, there are already too many stops on the proposed E line. Metro should be aiming for 10-block stop spacing: that’s just over half a mile in this part of the city, and the service guidelines call for RapidRide routes to have stops every half mile, to keep these heavily loaded buses moving. By adding these stops, Metro would be disregarding its own guidelines, driving up operating and capital costs, and short-changing riders further up the line. This is probably because the walkshed in this area is terrible, and there is already tons of other competing service into downtown for the few riders who are there. Why all buses terminate in Downtown Renton? It’s really strange that Talbot Hill has regular bus service to Kent, but nothing to anywhere north of crime ridden Renton TC. This Rapid Line is planned for a corridor that really doesn’t need so much service. It just puts a make up on a problem. It’s not fixing the issue of inconvenient transfers in Downtown Renton, let alone this Line F will be completely useless for majority of residents of Renton. Most people live up on the hills, not downtown, and work north in Bellevue and Seattle, not Kent or Burien. What a useless route and what a massive waste of funds. This money could be used to connect Renton’s northbound and southbound routes into single routes so people don’t have to transfer and waste time while buses make loops in congested Downtown Renton. Renton Transit Center is a crime magnet so transferring there is the last thing on our minds. Commuters from Benson and Talbot Hills will never travel like that, and that’s who makes up all of the traffic going north to Seattle and Bellevue in the morning and back in the evening. Congestion is very bad between downtown Renton and Benson Hill because no one has time to transfer in Downtown Renton. As far as this line F goes, it just duplicates route 140, which has no destination for Renton commuters. It misses the airport but goes to Tukwila Sounder and Tukwila Light Rail?! and Burien? I would rather see thses funds spend on extending 155 to the airport and extending 101 and 240 south to Valley Medical and Benson Hill. There is still no reliable bus route at Valley Medical Center that can connect riders to anywhere north of Renton TC, and still no service between overcrowded Benson Hill and regional destination like Bellevue, Seattle, and Seatac Airport. Instead of improving real commuting corridors in demand, KC Metro is putting all of these resources into another route that terminates in a no man’s land of Renton TC. This is a waste of funds.